Creating the basic structure of a Visual Studio project (inserting copyright info, adding commonly used assembly references, setting the default namespace/adding file system folders etc.) quickly becomes tiresome — this is particularly true when working as a web consultant, creating solutions for a wide range of customers. Using project templates which provide the basic structure of e.g. a component can save a lot of time in the long run, as most of the trivial configuration tasks can be handled automatically. Project templates also offer an excellent opportunity to provide your colleagues with implementation examples and boilerplate code which follow company and industry best practices. Create a project resembling the intended structure and content of the template. Copy all the files in the project folder to a suitable subfolder in the Visual Studio project template root. Add a basic vstemplate file to the template folder. Add custom parameters to the vstemplate file and use them in the various “file blueprints” of the template. Use the template to create a new project. Check to make sure all custom parameters and files are inserted as intended. Repeat steps 4 & 5 until satisfied with the result. Make the template available to colleagues by e.g. deploying it to a network share. Steps 1 – 4 are described in more detail below. Simply create a project, add some files to it, set root namespace and similar assembly information, add company and copyright info etc. The project template root is configured in Visual Studio via “Tools → Options… → Projects and Solutions → User project templates location”. Put the files from step 1 into the subfolder matching the project language beneath the project template root, e.g. “[project template root]/Visual C#/[…]” for a C# project. At this point the contents of e.g. “[project template root]/Visual C#/Reason→Code→Example/Component” simply consist of the project file (Component.csproj) and two class files (“/Properties/AssemblyInfo.cs” and “Constants.cs”). Without a vstemplate file, Visual Studio will not recognize the files from step 2 as a template, and will hence not show it as an option in the “Add new project”-dialog. 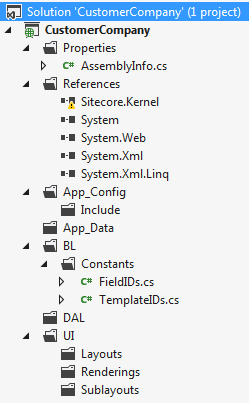 For an in depth description of the vstemplate format, see MSDN. An example of a vstemplate file (“template manifest”) is shown below, intended to be used in componentized solutions. The manifest makes it easy for me to tailor company specific information to clients, thus not having to modify other files in the project template. When giving lectures in Sitecore component architecture I usually hand out a project template based on the manifest shown below to developers at the start of the course. To use parameters in a file template, open it in a text editor, insert the parameter and make sure the ReplaceParameters-attribute is set to “true” for the appropriate node in the vstemplate file (e.g. “<Project File=”Component.csproj” TargetFileName=”$fileinputname$.csproj” ReplaceParameters=”true”>”). Using parameters in other file types follows the same pattern. After creating the project, the root namespace, framework etc. have been set to the values selected in the wizard. The layers “DAL”, “BL” and “UI” have been created as folders. As mentioned earlier, this is a good way of conveying company best practices to colleagues, helping to enforce a uniform structure recognizable across all solutions your company is maintaining. This entry was posted in Visual Studio and tagged Visual Studio project templates, Visual Studio templates. Bookmark the permalink. Is it posiible to create multiple project template? I am looking for a template which will define a Three tire architecture template which will have different projects such as BLL, DAL, Views etc. Create a project template for each of the project types you’d like to include in the solution, and make these work. Once the templates work flawlessly and your colleagues start complaining about having to create 3+ projects every time they create a new solution, have a go at creating a custom wizard. Creating a wizard isn’t rocket science, but you’ll need the project templates anyway so creating these first will get you started and provide something useful to you/your company immediately. Hi guys. You don’t need a wizard to do this. You can export multiple project types to .vstemplate files and then tie them all together with a single ‘root’ .vstemplate. do you have any clue where $targetframeworkversion$ is set and how to change it? The $targetframeworkversion$ parameter is set by the “New project”-dialog. So it’s the users choice at the time of project creation, and is set to the value selected in the “target framework” dropdown list in the “New project”-wizard. It’s the same way e.g. the $projectname$ parameter is set to the name the user types into the “Name” text box in the wizard. I have spent several hours searching for this answer and it was just under my nose! Seems so obvious but it is not. Pity that MSDN doesn’t say it anywhere. Do you know how to create correct template for multi-project solution, in which some of projects are in c# and some in C++?